Thought the cynlinder Mac Pro looked dope? 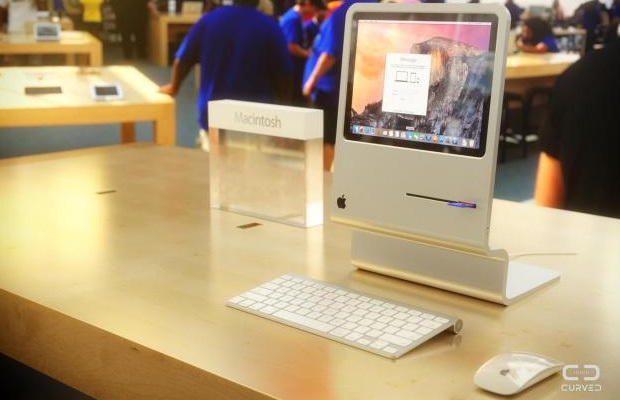 Get a glimpse of this iMac concept created by Curves Lab. The prototype takes its inspiration from the original Macintosh computer and applies a modern touch to it that replicates the recent look of the Mac desktops. Talk about a feat in computer engineering. Some of its key features include the same display found on the 11.6-inch MacBook Air and touch support. But one of its cooler attributes is the repurposed 3.5-inch disk slot, which was made to accommodate newer elements such as an SD card slot, FaceTime camera, speakers and a microphone. The company behind the design imagines this iMac to have a built-in battery that lets users setup the Mac “at different work locations on the fly.” How creative. Sadly it’s only a concept, one that will never be adopted by Apple. Nonetheless, it’s one of the cooler desktop concepts we’ve seen over the past year.